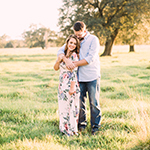 Katie and Josh came out to the ranch on on a sun-drenched evening this fall for their engagement shoot. From the very first time that these two sat on our couch and visited with us about their wedding day, we knew they were a very special couple. Just look how they light up around each other. Congratulations, you two! 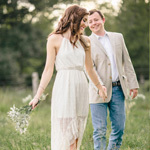 If you like Katie and Josh's ranch engagement session, you might also enjoy Audrey and Philip's fall engagement session on film, or Kristen and Landon's sun-filled ranch engagement shoot. 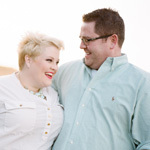 Are you an engaged couple who values hard work and tough love and the tenderness of a true connection? If so, you're just the type of people that Luke and Cat love to work with. 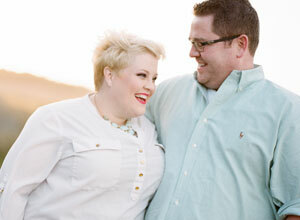 They will photograph your love story with timeless, crafted images that show the authenticity of the life you share. Visit Luke and Cat's website.